I’d forgotten how difficult the drive down into Murlough Bay in Northern Ireland can be! Although only around 10km from Ballycastle, the roads feel quite remote due to their size and twisting nature. Having left home in lashes of rain at 3am, I was very dubious about whether there could be any sunrise colour. As always, a backup plan was in place should the worst come to worst. Had I not agreed to travel with another photographer, I would have been very tempted to stay in bed. Nearing the north coast, there was very little in the way of cloud cover and Murlough Bay was chosen as the best possibility for the morning in the hope that we might get a little cloud. I’ve gotten this info from several other sites and collated it here in my own words. 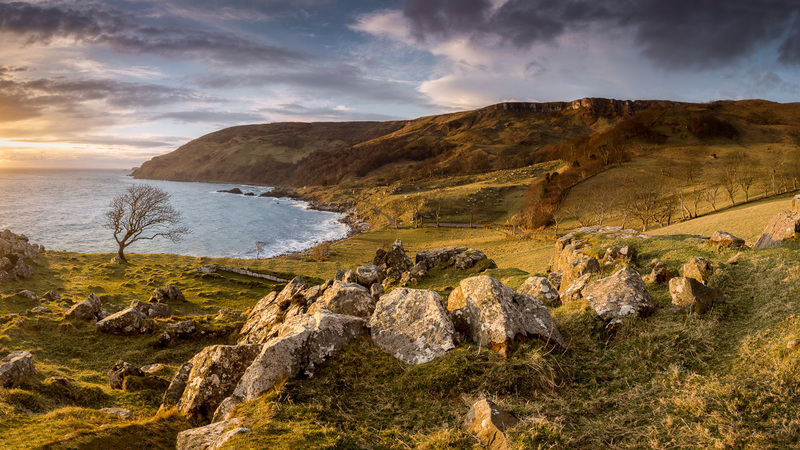 Being a little off the beaten track, Murlough Bay is still quite under visited thanks to its very inaccessible entrance. The steep gravel lane does not lend itself easily to buses of tourists – long may it last. The grand vistas experienced from the top of the cliff are breath taking. Protected from the cliffs above, the micro environment here is very different to the barren ground above the ridge. Murlough Bay’s name comes from the Celtic “Murlach” which means ‘sea inlet’. Legend has it that this bay was the summer residence of the ancient Celtic Kings. Early Christians built Drumnakill Church on the small hillock in the centre of Murlough Bay. Its name is derived from the Irish words ‘Droim na Coille’ meaning ‘ridge of the wood’. As with most of the northern coastline, the Bay also has Scottish connections. Local legend has it that the MacDonnell clan made their warning-fires in times of trouble at the top of the bay. Reinforcements from their Kintyre homeland could then make the relatively quick crossing to support them. The deep waters of the sheltered cove provide an ideal landing point for small boats. From the 1700’s to the 1940’s, coal and limestone were mined here. It is evidenced by the ruins of some miner’s cottages north of the bay on the path to Fair Head. A kiln remains that would have processed limestone quarried from the cliffs above. To my knowledge, the old church ruins, mentioned earlier, is where Sir Roger Casement had wished to be buried. He was executed in the UK for treason against the British after the 1916 rising. He had been caught trying to land arms from Germany. Prime Minister Harold Wilson‘s government had released the remains only on condition that they could not be brought into Northern Ireland, as “the government feared that a reburial there could provoke Catholic celebrations and Protestant reactions. His remains are now in the republican section of Glasnevin cemetery. 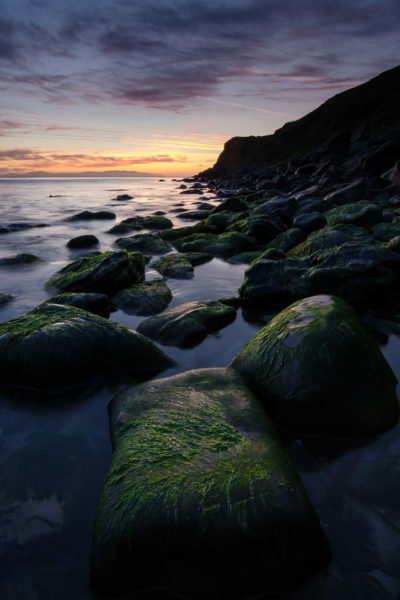 For GOT’s fans, this location features in several scenes and is best known in the series as “Slavers Bay”. Thankfully, the access issues described earlier has stopped the area becoming another “Dark Hedges”. Having only visited twice, my knowledge of the area is a little limited. I was quite inexperienced as a landscape photographer on my 1st visit but still managed to come away with some beautiful seascapes deeper into to bay. A two-minute walk from the carpark will have you at Murlough bay’s honeypot location which has been seen & shot by many. The small tree sitting beside the ruins of the Drumnakill Church provides a beautiful vantage point across the bay. Marry this with the foreground boulders and some separation between tree & headland, and you are guaranteed a decent shot. All you need to do is wait for the right light at sunrise. Unfortunately, this is as far as I have seen most photographers get with this location. As you can see, I’m not above taking the obvious shot when it is there to be had. 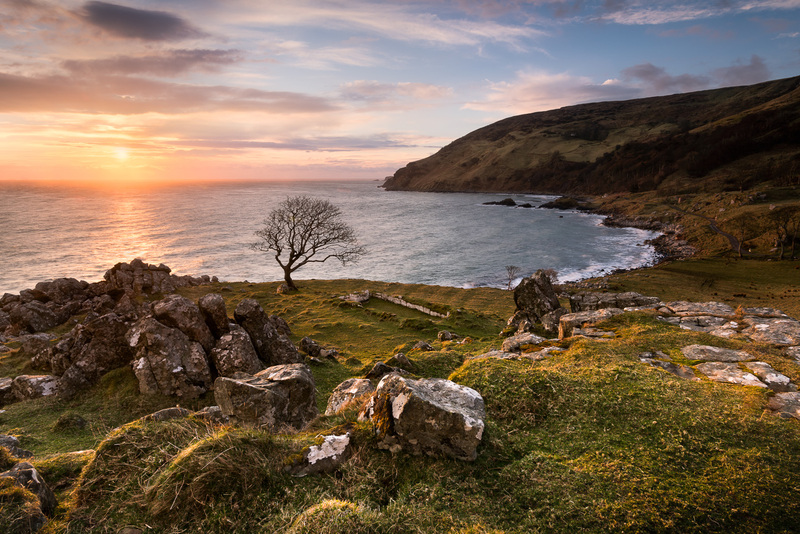 Early morning sunrays cast their warmth across Murlough Bay, co Antrim in Northern Ireland. A remote but stunning location….. Unfortunately, the beautiful shoreline goes completely ignored by most. There are potential images literally littered along the coast both north & south of the tree. The first time visiting, I went as far south as possible and was rewarded with the beautiful sunrise you see at the top of this blog. On this occasion, I also headed north towards Fair Head. It has huge untapped potential. I have yet to see any images from here posted on-line, although I may stand to be corrected. The huge head forms a dramatic backdrop while the foreground boulders provide plenty of material to work with. Unfortunately, the best of the light had faded by the time I made it to this point but I was still able to find decent compositions. Using muted cold tones, I kept the mood cold as the weather started to turn against us. The track to this point, which I believe is called the “grey mans track” is a little tricky to say the least as it is very uneven and boggy. Caution is advised. I have yet to trek up the sides of the bay but they look promising with the little stone walls and twisted trees littering the view. Maybe my next visit will allow me to explore more. I certainly won’t be leaving it another 4 years to return! !